Remove the oil filter with the oil filter wrench. 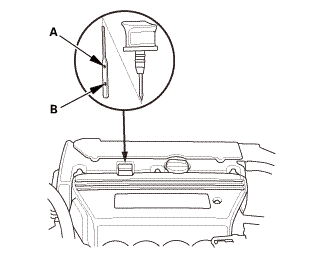 Inspect the filter to make sure the rubber seal is not stuck to the oil filter seating surface of the engine. Inspect the threads (A) and the rubber seal (B) on the new filter. Clean the seat on the oil filter base. Apply a light coat of new engine oil to the oil filter rubber seal. NOTE: Use only filters with a built-in bypass system. Remove the exhaust pipe bracket (A). 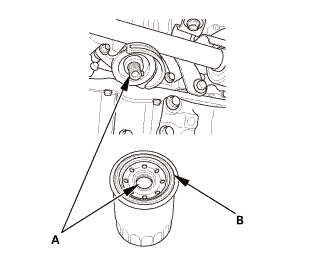 Remove the oil filter base (B). Clean the O-ring grooves and mating surface with the oil filter base. 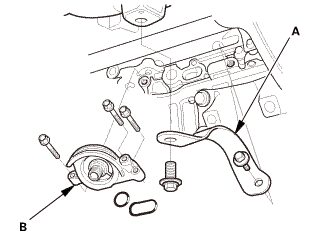 Install the oil filter base (A) with new O-rings (B). Install the exhaust pipe bracket (C). Install the oil filter by hand. 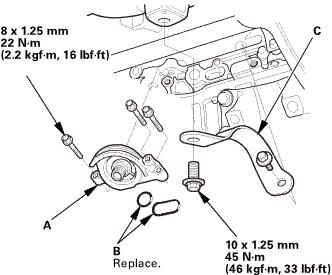 After the rubber seal seats, tighten the oil filter clockwise with the oil filter wrench. If four numbers or marks (1 to 4 or ▼ to▼▼▼▼) are printed around the outside of the filter, use the following procedure to tighten the filter. 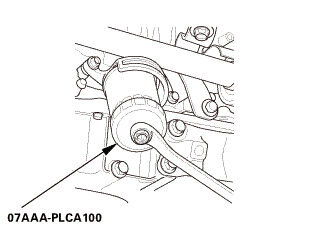 Spin the filter on until its seal lightly seats against the oil pan, and note which number or mark is at the bottom. Tighten the filter by turning it clockwise three numbers or marks from the one you noted. 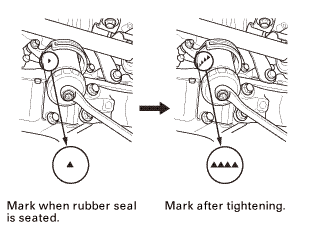 For example, if mark▼is at the bottom when the seal is lightly seated, tighten the filter until the mark ▼▼▼▼comes around to the bottom. Park the vehicle on level ground, and start the engine. Hold the engine speed at 3,000 rpm with no load (in neutral (M/T model) or P or N (A/T model) ) until the radiator fan comes on, then turn off the engine, and wait more than 3 minute. Remove the dipstick, and wipe off the dipstick, then reinstall the dipstick. Check the engine oil level. It should be between the upper mark (A) and the lower mark (B). If the engine oil level is near or below the lower mark check for oil leaks, and add the engine oil to bring it to the upper mark. Run the engine for at least 3 minutes, then check for oil leaks.